Canadian Tire Motorsport Park (formerly Mosport Park and Mosport International Raceway) is a multi-track motorsport venue located north of Bowmanville, in Ontario, Canada. The facility features a 2.459-mile (3.957 km), (length reduced through wider track re-surfacing done in 2003) 10-turn road course; a 2.9 km advance driver and race driver training facility with a quarter-mile skid pad (Driver Development Centre) and a 1.5 km kart track (Mosport Kartways). The name "Mosport" is a portmanteau of Motor Sport, came from the enterprise formed to build the track; it is pronounced as the two words actually sound, "Mo-Sport" (but is often incorrectly pronounced "Moss-Port"). Moss Corner – Turn 5a and 5b. Tunnel, Whites Corner – Turn 10 and Event Centre. The circuit was the second purpose-built road race course in Canada after Westwood Motorsport Park in Coquitlam, British Columbia, succeeding Edenvale (Stayner, Ontario), Port Albert, Ontario's Green Acres (ex-British Commonwealth Air Training Plan), and Nanticoke, Ontario's Harewood Acres (ex-British Commonwealth Air Training Plan Number One Bombing and Gunnery School), all airport circuits, as Ontario racing venues. The track was designed and built in the late 1950s. The first race to be held on the track was a local event organized by the Oakville Light Car Club in June 1961. Shortly thereafter, on June 35, the venue held its first major race, the Player's 200, a sports car race bringing drivers from the world over to rural Ontario. Stirling Moss won the two-heat event in a Lotus 19. Second was Joakim Bonnier with Olivier Gendebien third. The proposed hairpin was expanded into two discrete corners, to be of greater challenge to the drivers and more interesting for the spectators, at his suggestion, and is named Moss Corner in his honour. This is a source of lingering confusion as many people call the track Mossport. Unlike many historic motorsport venues, Mosport's track layout has remained mostly unchanged from its original form. For 2001, the entire circuit was repaved to meet FIA specifications, and is now 42 feet (12.8 m) wide. Drivers were consulted to ensure the character of the "old" track was kept; almost all the "racing lines" have been maintained. Mosport achieved acclaim though a series of international sports car races under the title "Canadian Grand Prix" normally reserved for Formula 1 races. Many events were wildly popular, breaking Canadian sports attendance records with each successive race. The success of these races led Mosport to be seen as a key component in the founding of the Can Am Series. The CanAm first visited the track in its inaugural season in 1966, and Mosport hosted at least one event in every year of the series' history, except 1968. In 1967, Canada's centennial year, Mosport hosted Formula One, USAC, and a 500cc Motorcycle Grand Prix. F1's Grand Prix of Canada remained at the track until 1977, until it was moved to Montreal. Mosport has hosted a wide variety of series throughout its history. The circuit has held Formula One, USAC, World Sportscar Championship, Can-Am, Formula 5000, and many other sports car, open-wheel, and motorcycle series. Mosport has had several fatalities, both track crew, drivers, and riders, the most recognized being German Formula One driver Manfred Winkelhock who was killed in 1985 when his Porsche 962C crashed into a concrete wall. Another fatality at the track was in 2008 during the 29th annual Vintage Automobile Racing Association of Canada Racing Festival. Driver Dino Crescentini of Rochester Hills, MI – a ten-year veteran of vintage racing – lost control of his 1977 Wolf Dallara Can-Am car, which previously had been driven by Gilles Villeneuve. The most recent fatality was in 2018 when 61 year old former Pro Mazda driver Jeff Green speared off the racetrack at turn 8, and slammed into the barrier. He was attended to quickly but was unable to survive the crash. The fastest ever recorded lap was taken by Rinaldo Capello, in an Audi R10 TDI, in qualifying for the 2008 Grand Prix of Mosport, with a time of 1:04.094. The lap record was set in the race for that meeting with Capello's Audi Sport North America teammate Marco Werner lapping in a time of 1:05.823. Mosport has had a succession of owners since the original public company created to build the track. Two of those prior owners, Norm Namerow (who owned the track through his publishing company, CanTrack, until his death) and Harvey Hudes, have both been inducted into the Canadian Motorsport Hall of Fame for their contribution to the sport in Canada. In 1998, Panoz Motorsports purchased the facility, and in 1999, the newly formed American Le Mans Series visited Mosport for the first time. Canadian Motorsports Ventures Ltd. (CMV) which includes Orlando Corp. Chairman Carlo Fidani and Canadian road racing driver Ron Fellows, purchased the facility in June 2011. In February 2012, a partnership between Mosport and Canadian Tire was announced. The partnership includes a renaming of the track to Canadian Tire Motorsport Park. The partnership will help to upgrade the facility, and improve the experience for spectators, participants, race teams, and corporate sponsors. In the spring of 2000, Mosport opened the Driver Development Centre, a second 1.7 km, 12 turn training circuit designed for driver development. The new course was designed by the owners and instructors of the Bridgestone Racing Academy and was designed specifically with fewer guard rails, walls and minimum blind corners to meet the needs of their driver and mechanic training program. Due to significant scheduling demands on the original grand prix circuit, the original academy course was reconstructed and lengthened to a full racing course in the fall of 2013. The new track features two configuration options; a 2.2 km intermediate course, a 2.9 km advanced course, as well as a skid pad, a pit lane, and a multi-storey event centre with classrooms and other facilities. Mosport Speedway was a one-half-mile oval speedway located on the northwest corner of Canadian Tire Motorsport Park. The track featured 800-foot long straightaways, 6-degree banked corners and two grandstands with seating for 8,500. 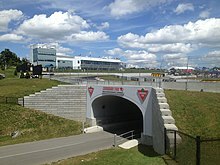 The oval was constructed in 1989 as a dirt track originally called Mosport's Ascot North, named after the famous Ascot Park track in Gardena, California. The first event was scheduled in July 1989 and was to feature USAC Midgets and Sprint Cars and the World of Outlaws. The races were cancelled after the initial heat races caused deep ruts in the corners and dislodging stones hidden under the clay. The track was paved that summer and renamed Mosport International Speedway. The track hosted a weekly Saturday night stock car racing program from May to September for 24 years. The stock car divisions included pure stock, sportsman and late models. The oval also featured regular touring series including the ACT Series, ISMA Supermodifieds, OSCAAR, Lucas Oil Sportsman Cup, CASCAR Super Series and the NASCAR Canadian Tire Series. The park announced the closing of the oval in July 2013 to accommodate the expansion of the Driver Development Centre. It was announced in September 2013 that Canadian Tire Motorsports Park was chosen to host an annual round of the IMSA United SportsCar Championship beginning in 2014. The new series replaced the American Le Mans Series as the feature race during the tracks annual SportsCar Grand Prix, which is Canada's largest annual sportscar race. The NASCAR Gander Outdoors Truck Series began racing at Canadian Tire Motorsport Park in September 2013, marking the first time the series has raced in Canada. Chevrolet was announced as the title sponsor and the race is known as the Chevrolet Silverado 250. The NASCAR Pinty's Series has visited the facility at least twice annually every year since its inaugural season in 2007. Currently the race is known as the Clarington 200 and takes place during the tracks Victoria Day SpeedFest Weekend and its Chevrolet Silverado 250 weekend. The track also hosts vintage racing series, motorcycle racing, and Canadian Automobile Sport Club (CASC) amateur events and lapping days. ^ "Mosport renamed Canadian Tire Motorsport Park in new partnership; Autoblog Canada". February 10, 2012. Archived from the original on May 17, 2014. Retrieved March 26, 2013. ^ "History". Canadian Tire Motorsport Park. Archived from the original on July 17, 2014. Retrieved June 19, 2014. ^ Charters, David A. (2007). The Chequered Past: Sports Car Racing & Rallying in Canada, 1951–1991. University of Toronto Press. pp. 123–124. ISBN 978-0-8020-9394-3. ^ Heather Ridge and Dennis Jeffrey, "The History of Canadian Tire Motorsport Park" Archived June 23, 2016, at the Wayback Machine, Clarington Promoter, June 2016, pages 1 and 4. ^ The Globe and Mail, June 26, 1961, Page 15. ^ "Canadian Tire Motorsports Park Overview". Canadian Tire Motorsports Park. Archived from the original on July 29, 2013. Retrieved March 26, 2013. ^ "Canadian Tire Partners With Mosport". Mosport.com. Retrieved February 12, 2012. ^ Fagnan, René (July 27, 2010). "The Bridgestone Racing Academy: Now's your turn to drive!". auto123.com. Retrieved 2014-01-17. ^ "Bridgestone Racing Academy". European Car. February 1, 2005. Retrieved 2014-01-17. ^ Wallcraft, Stephanie (December 30, 2013). "Memories of 2013 Our 'newsmakers of the year' breathed new life into Mosport". The Toronto Star Wheels. Toronto: Torstar Corporation. Retrieved 2014-01-17. ^ "Bowmanville speedway set to run its final lap". Durham Region.com. Retrieved 2013-09-11. ^ "Canadian Tire Motorsport Park Oval". Racing-Reference.info. Retrieved 2013-09-11. ^ "Canadian Tire Motorsport Park Closing Speedway July 27, 2013". Inside Track Motorsport News. Retrieved 2013-09-11. ^ "IMSA Announces 2014 Tudor United SportsCar Championship schedule". Autoweek. September 20, 2013. Retrieved 2013-10-25. ^ "News and info for the SportsCar Grand Prix at CTMP". PRN Ignition. July 3, 2013. Archived from the original on October 29, 2013. Retrieved October 25, 2013. ^ "Canada to Host Truck Race in 2013". Motor Racing Network. November 16, 2012. Archived from the original on January 29, 2013. Retrieved 2012-12-22. ^ "Chevrolet To Sponsor NASCAR Camping World Truck Series Race at Canadian Tire Motorsport Park". Canadian Tire Motorsport Park. April 29, 2013. Retrieved 2013-04-29. ^ "VARAC Vintage Grand Prix". ^ "Major Spectator Events". Canadian Tire Motorsport Park. Archived from the original on May 22, 2013. Retrieved March 27, 2013. ^ Charters, David A. (2007). The Chequered Past: Sports Car Racing & Rallying in Canada, 1951–1991. University of Toronto Press. ISBN 978-0-8020-9394-3. ^ "Results". autocourse.ca. Retrieved September 23, 2014. ^ "History of CASC-OR". Canadian Auto Sport Clubs-Ontario Region. Retrieved September 23, 2014. ^ "History". British Empire Motor Club. Retrieved September 23, 2014. ^ "USAC Stock Car race". Ultimate Racing History. Retrieved 2013-04-15. ^ "Kawartha 250". Ultimate Racing History. Retrieved 2013-04-15. ^ "Mosport 250". Ultimate Racing History. Retrieved 2013-04-15. ^ "Molson Diamond Indy". Ultimate Racing History. Retrieved 2013-04-15. ^ "1974 CASC Player's Challenge Series". champcarstats.com. Retrieved 2013-04-24. ^ "1975 CASC Player's Challenge Series". champcarstats.com. Retrieved 2013-04-24. ^ "1976 CASC Player's Challenge Series". champcarstats.com. Retrieved 2013-04-24. ^ "1977 CASC Labatt Challenge Series". champcarstats.com. Retrieved 2013-04-24. ^ "1979 CASC/SCCA North American Formula Atlantic Championship". champcarstats.com. Retrieved 2013-04-24. ^ "1981 CASC/SCCA North American Formula Atlantic Championship". champcarstats.com. Retrieved 2013-04-24. ^ a b "1982 CASC/SCCA North American Formula Atlantic Championship". champcarstats.com. Retrieved 2013-04-24. ^ "1983 FIA Formula Mondial North American Cup". champcarstats.com. Retrieved 2013-04-24. ^ "1988 ECAR/SCCA HFC Formula Atlantic Championship". champcarstats.com. Retrieved 2013-04-24. ^ "1989 SCCA Toyota Atlantic Championship – Atlantic Division". champcarstats.com. Retrieved 2013-04-24. ^ "1992 SCCA Toyota Atlantic Championship". champcarstats.com. Retrieved 2013-04-24. ^ "1993 Player's Toyota Atlantic Championship". champcarstats.com. Retrieved 2013-04-24. ^ "1994 Player's Toyota Atlantic Championship". champcarstats.com. Retrieved 2013-04-24. ^ "2009 Cooper Tires Presents the Atlantic Championship Powered by Mazda". champcarstats.com. Retrieved 2013-04-24. ^ "1974 SCCA/IMSA Formula Super Vee Championship". champcarstats.com. Retrieved 2013-04-24. ^ "1975 SCCA/IMSA U. S. Formula Super Vee Championship". champcarstats.com. Retrieved 2013-04-24. ^ "1976 SCCA U. S. Formula Super Vee Championship". champcarstats.com. Retrieved 2013-04-24. ^ "1977 SCCA U. S. Formula Super Vee Championship". champcarstats.com. Retrieved 2013-04-24. ^ "1979 SCCA Formula Super Vee Championship". champcarstats.com. Retrieved 2013-04-24. ^ "1982 SCCA Robert Bosch U. S. Formula Super Vee Championship". champcarstats.com. Retrieved 2013-04-24. ^ "1983 SCCA Robert Bosch Formula Super Vee Championship". champcarstats.com. Retrieved 2013-04-24. ^ "1989 USAC National Sprint Car Schedule". scrafan.com. Retrieved 2013-09-06. ^ "Mosport International Raceway". Ultimate Racing History. Retrieved March 27, 2013. ^ "Mosport – List of Races". Racing Sports Cars. Retrieved March 27, 2013. Wikimedia Commons has media related to Mosport International Raceway. This page was last edited on 24 March 2019, at 10:05 (UTC).